NetHabilis FloorSales is an optimal and affordable order taking mobile solution for every professional and company that wishes to take orders quickly, easily and affordably, without piles of paperwork, delays and mistakes, while at the same time ensuring rich business information on orders, sales, salesperson productivity and client transactions. 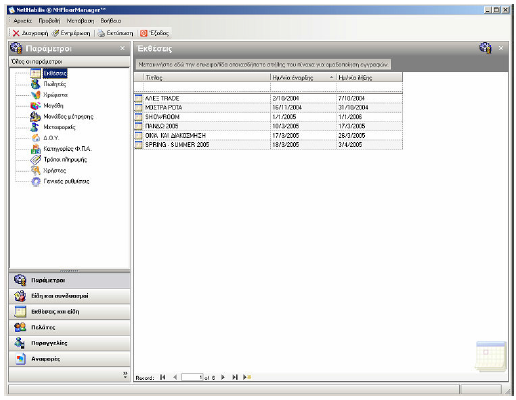 The system offers full functionality, friendliness combined with ease of use and low cost, as well as equipment (portable wireless terminals, last generation barcode, barcode printers, wireless communication antennas, etc.) and services that NetHabilis can offer. 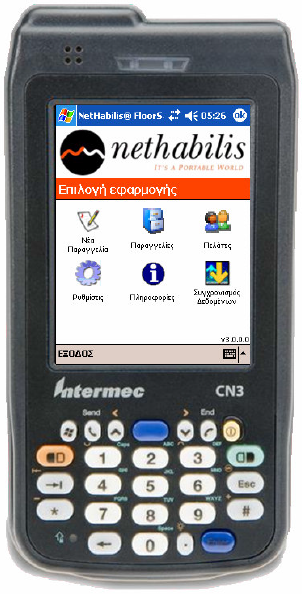 NetHabilis FloorSales uses mobile wireless terminals equipped with industrial strength barcode readers or RFID (Radio Frequency Identification) readers for fast and error free reading of any product barcode, encoded in any barcode symbology. The system operates within a safe, encrypted wireless communications network, ensuring the integrity and safety of your business data. The system uses any A4 printer for the professional printing of your customer orders, giving complete freedom of movement to your sales staff, without requiring the mobile terminal to connect to a base station in order to print the details of a customer order. NetHabilis FloorSales can handle an unlimited number of product codes, along with any special features such as color and/or size and it can be configured to be used by professionals in various markets, such as jewellery, clothing / footwear, folk art, furniture, gifts, industrial tools, standardized food / drinks, etc. Any kind of product can be introduced into NetHabilis FloorSales, regardless of its individual characteristics. Ability to enter an unlimited number of articles/products, customers, orders, colors, sizes, exhibitions, etc. Rich reporting for sales managers that helps them identify how and which articles/products are more popular, what are the current number and total value of orders taken, salesperson productivity, customer buying trends per exhibition or in total , etc. Low cost solution that can be used by any professional or business, whether it employs one employee or group of employees. Last but not least, NetHabilis FloorSales will enable you to place exact orders with your suppliers without the need to order more than you need, or order products that will not be popular among your clientele. NetHabilis FloorSales helps you take more orders in less time, in a professional manner, without mistakes and delays. Trust us with your business. Join other companies already reaping the benefits of our solution.